The free HD video converter from MediaProSoft is proving itself to be a powerful, easy-to-use video converter that users can use with most video formats on the market today. Video files like AVI, MPEG, MP4, etc are easily switched to high definition files without losing any quality. Not only does this free HD Video converter converts video files to HD format but one can also separate the audio files from video and create sound files. This sound extracting option allows users to create their own audio CD. Free HD video converter also has the settings that enable users to be able to use the video output with the various smart-phones and music devices, readily available these days. As mentioned, the conversion of sound files from video files. Converts all video formats to HD video files. The conversion is fast and there is zero quality loss. A detailed configuration and defined parameters which are ideal for professional or casual use. Its user-friendliness means that even the most inept computer user will be able to use this free software without a problem. For those who are not confident, initially using this program, a step-by-step wizard helps users learn how to convert files. The log file allows users to keep a record of what he or she has converted. This log can be deleted at anytime. With advent of the digital video camera, more and more camera owners want to edit or convert their videos files to different formats and therefore many scour the Internet looking for such programs as this free HD video converter. Once these searching souls have found this free program, their conversion worries are no more.You can also check out HD video player, and download HD videos free. When converting video files to HD, one does not have to wait for the process to end before doing other tasks the conversion is an automatic process and once completed will either shutdown the computer or play the converted file or files. There are many other programs available over the Net that you can download to convert video, however, this free HD video converter is one of the best freeware programs that can be easily downloaded and setup. This comes from the makers of batch youtube to ipod converter. 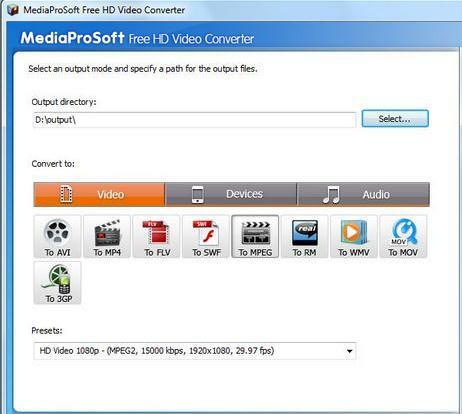 Try Mediasoft HD Video Converter for easy video conversion to HD.